Subeo chose Cannes International Boat Show 2001 for the official unveiling of Gemini, and it’s easy to see why. Numbers were up 25% on the previous best year with many different boat businesses represented. “The biggest interest has been from some of the world’s most respected yacht designers” said Robert Leeds, chief designer and Managing Director of Subeo. “At least 3 are working on designs influenced by Gemini, the most ambitious of which involves a submarine stored and launched from under a yacht’s hull” said Robert. Other trade interest includes several boat agents wanting exclusive rights to represent Gemini. We expect to announce more agents for various countries shortly. 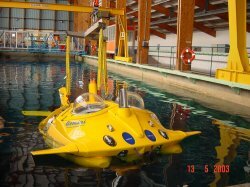 A 3-man version of Gemini is ideal for tourism and 2 major Middle East companies have expressed interest in 3 and another up to 6 submarines. 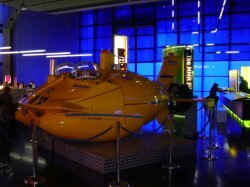 Said one “The multi-passenger submarines of 10 plus passengers are cumbersome and expensive to run. Gemini will be a profitable addition to our fleet”. 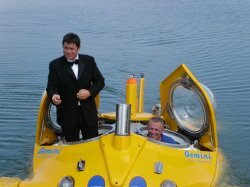 On a lighter note 3 members of Jacques Cousteau’s’ Calypso team pored over the submersible. 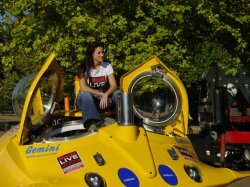 All wanted their picture taken with Gemini and wished underwater travel could have been as comfortable as this in their day. Talking about how the show had been for Subeo, director David Harvey said, “Gemini is a prototype designed for mass production. 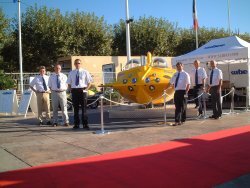 We wanted to discover if there was a market for a submarine with this specification plus looks, and based on the interest to date, there most certainly is”. “There has been nothing new in the motor boat world for over 15 years” said Subeo’s marketing man, Martin Hale. 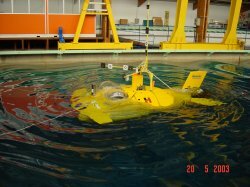 Very successful trials were carried out at IFREMER in France under the Metri programme funded by the European Union. 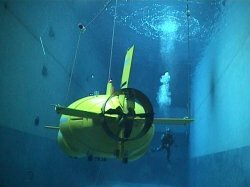 IFREMER is a French, world-renowned marine institute that operates the deep submersible ‘Nautile’ which discovered the Titanic. The ¼ scale model of the 3-person vehicle and propulsion system was evaluated. The 3-person production vehicle has a very low drag co-efficient 0.28. Using a 20kw drive train the full size vehicle would achieve velocities in the region of 7-8 knots. The craft will be powered by ‘state of the art’ nickel, sodium batteries. These batteries are particularly suitable for submersibles as they do not produce hydrogen gas during the charging process. They are fully sealed and have excellent energy-weight characteristics when compared to lead acid batteries, the normal energy source for submersibles/submarines. 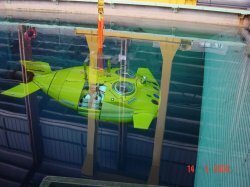 The testing of the full size 2-person vehicle in the Deep Ocean Basin Tank at Brest was very informative and resulted in a good performance, both on the surface and underwater, with excellent underwater video footage being taken. During June 2003, Discovery were filming the craft in action at Subeo’s test site in Essex for a production of ‘He’s gotta have it’ with presenter Mike Brewer which was transmitted in the autumn. Subeo displayed Gemini at the Tomorrow’s World Road Show at Olympia as a main feature at the show. This event, supported by British Gas was an interactive show for secondary school children and was open to all schools in the UK and the entrance was free. The show was open from 9.40 – 16.00pm on 7 – 10 July 2003. 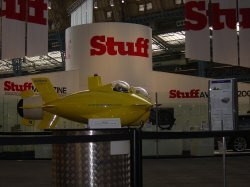 Gemini was featured in ‘The Gadgets, Gear and Technology Show’ at Olympia in London in September 2003.